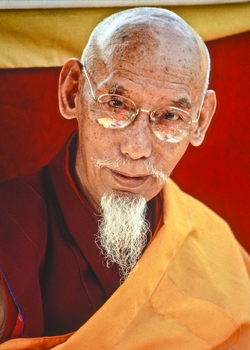 His Holiness Kyabje Zong Rinpoche (1905-84) was born in Kham, Tibet. He studied at Ganden Monastery, where he gained renown as a learned geshe and great debater. After graduating as a lharampa geshe at the age of twenty-five, he moved to the Tantric College of Gyuto. In 1937 he was appointed abbot of Shartse, a position he held for nine years. Rinpoche fled to India in 1959 and later served as principal of the Institute of Higher Tibetan Studies in Sarnath, before moving to his old monastery, Ganden Shartse, at its new location in South India. 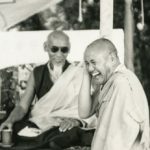 Rinpoche first came to teach in the West in 1978, at the request of Lama Thubten Yeshe. He travelled to the West three times and stayed for extensive periods in the USA and Europe. Thousands of Westerners received teachings from him, both in the West and in India, and he forged strong links with Dharma centers in America, Canada, England, France, Italy and Switzerland. Read a more extensive biography of His Holiness Kyabje Zong Rinpoche on the FPMT website.